New title by Jan Shapiro gives a guided tour through the art and science of the jazz vocal style. So You Want to Sing Jazz -- a new book targeting singers and voice teachers who want to focus on the jazz vocal style – has been released. Singer and professor of voice Jan Shapiro gives a guided tour through the art and science of the jazz vocal style. 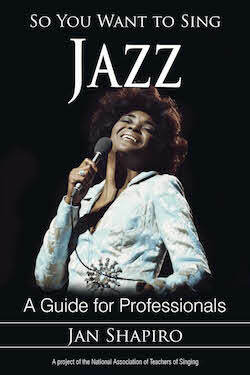 Throughout the 208-page volume, Shapiro hones in on what makes jazz singing distinctive, suggesting how other types of singers can make use of jazz. Shapiro looks at such key matters in jazz singing as the role of improvisation, the place of specific singers who influenced and even defined vocal jazz as we know it today, and the unique way in which jazz incorporates vibrato, conversational delivery, rhythmic phrasing, and melodic embellishment and improvisation. The book includes guest-authored chapters by singing voice researchers Dr. Scott McCoy and Dr. Wendy LeBorgne, as well as audio and visual examples from the NATS website. In So You Want to Sing Jazz, singers and voice teachers finally have the go-to resource they need for singing vocal jazz. About the author: Jan Shapiro has been on the faculty of Boston's Berklee College of Music for the past 31 years, and is a world -class practitioner of the art of jazz singing. She served as chairwoman in Berklee College's vocal department for more than a decade. So You Want to Sing Jazz is the third volume in the So You Want to Sing: A Guide for Professionals series of works produced under the direction of the National Association of Teachers of Singing in partnership with Rowman & Littlefield Publishers. Other volumes in the series have included So You Want to Sing Music Theater and So You Want to Sing Rock ‘n’ Roll. Each volume is devoted to providing a complete survey of what it means to sing within a particular genre, and each contribution functions as a touchstone work for professional singers as well as students and teachers of singing. Titles in the series offer a common set of topics so readers can navigate easily the various genres addressed in each volume. So You Want to Sing Jazz is available directly from the publisher, and from Amazon and other booksellers in paperback as well as e-book versions.